Once in a while it’s important to look back to examine how well we saw the future from the past. 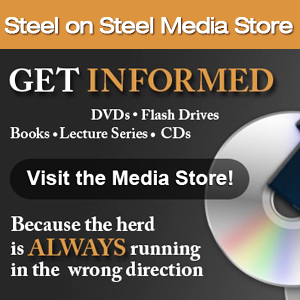 Former Congressman Tom Tancredo of Colorado was a frequent Steel on Steel guest long before he became a controversial congressional figure regarding border security. Tom returns to the show to discuss everything from politics to education to how Americans see themselves. Quite a few bills are roaring through congress right now, which will radically change economic life, but they’re receiving scant attention. One of those is HR699, which will virtually shut down mining in this country overnight if passed. Dave Morgan from the Silver Investor Newsletter (www.silver-investor.com) and Bob Hopper, President of the Bunker Hill Silver Mine in Idaho, join us. In the light of major paradigm shifts underway, we’ll continue a thread begun a few weeks ago. Since government social programs are virtually bankrupt, churches need to anticipate now how they will handle the needs of elderly members in their congregations. Julie Garron is a creative woman, who sees the train wreck coming, and is already underway toward achieving that goal. John’s boralogue addresses why jettisoning or ignoring laws in the name of helping “the people” in a crisis is a bad idea. John cites examples from the French Revolution, the Bolshevik Revolution and Nazi Germany to show why that only leads to serious mischief.